As time goes on we seem to receive an incessant flow of favourable comments from people who claim to be “tyros”. On the other hand we do receive critical comments – and I would worry if we didn’t! Thus Tony Davis has e-mailed from Dortmund and quite rightly criticised us for our use of hand drawn graphics. This will cease forthwith!! He also points out that our manners are not up-to-much! He is quite correct. We will in future inform author’s in advance that their comments are to appear (and when). Tony points out that articles should be “kept apart” so that you readers can down-load what is of interest and ignore the rest. If you have read the early editions of Vol I you will know that we decided from the start that we would make selectivity a problem. We want you to read it all to let you see what is possible and how those techniques unfamiliar to you might have relevance to your work. So – I’m sorry Tony – I’m unrepentant! Geoff Dent at Zeneca replied – I couldn’t believe the flattery in the first sentences! I presume Geoff will claim a bottle of excellent wine! “Some years ago Ira Levin of NIH at Bethesda in Md USA pointed out that since for materials that are poor scatterers and especially those dissolved in aqueous solutions high laser powers are essential, sample heating is a real problem. To minimise heating (and in the sort of bio-materials he studies this is essential) Dr Levin proposed that a thermal transfer fluid be used. Water is ideal but, of course, it absorbs near infrared radiation, so he recommended the use of D2O. His cell look schematically like Figure 1 and is made of metal. A variant was offered at one time as an accessory through Perkin Elmer. More recently, people have reverted to sample rotation. The idea is that the amount of the sample illuminated by the laser is small and if the sample is moving, the exposure will be for a very limited time. 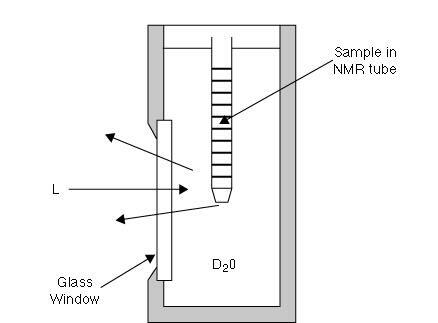 Sample rotators usually hold NMR tubes and rotate the sample at around 50r/r.p.m. Most experts insist that movement of the sample in an F-T experiment is a poor idea but this now has been challenged! A.T.G. De Paepe, J.M. Dyke, P.J. Hendra and F.W. Langkilde `Rotating samples in FT-Raman spectrometers’, Spec. Acta Special Edition VII, Vol.53A, No. 13, 2261-66, November 1997. Slow rotation as is normally used is just fine. 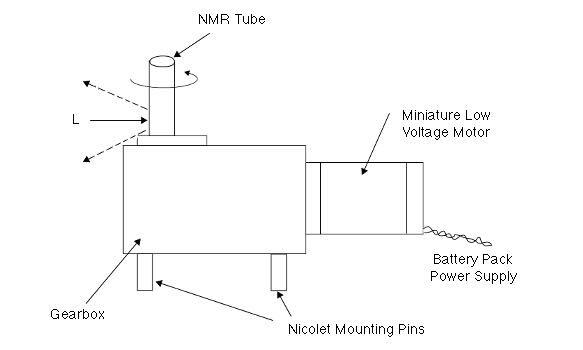 Nicolet market a rotator (Figure 2) and designs that fit other FTIR instruments are available from Wotton Scientific Ltd of Wotton under Edge in the UK (Fax +44 1453 843 968). 37 Many users of infrared and potential users would benefit from first class training courses. Dr Mike Lewis of Cookham Spectroscopy Services recently sent in the following piece. Since I am on their list of tutors I can hardly do anything else than recommend the courses!! A series of courses is held throughout the year on different aspects of infrared spectroscopy. “Interpretation of Infrared Spectra”, “Quantitative Infrared Analysis” (basic and advanced) and “IR spectroscopy in the Quality Control Laboratory”. If you are new to the technique you will find the “Introduction to Infrared Spectroscopy” course a good foundation on which to build. The “Sampling Techniques for Infrared Spectroscopy” surveys most current devices for sample preparation and presentation. These modular courses last from 1 to 5 days, and are often held back-to-back so that participants can attend a mini-series. Lectures and practical sessions are held in the well equipped laboratories of Perkin-Elmer Ltd in the UK. Courses are also held from time to time for overseas users of infrared spectroscopy. These are specifically designed for people for whom English is not their first language. Perkin-Elmer Ltd, Post Office Lane, Beaconsfield, Bucks, HP9 1QA, UK.